Use the Chargeback Reversal Agreement if you have a customer who charged back a product or service inappropriately. You may need written permission from them to get the chargeback reversed. Use this in cases where the chargeback was by mistake for example. The intent is to get their statement in writing to take back to the credit card processor in case the customer is not being cooperative. It is always best to have written authorization up front on charges to avoid having to go back to the customer if problems occur as the credit card companies almost always side with the card holder, even if it is a fraudulent chargeback. This Chargeback Reversal Agreement (Standard) is included in editable Word format that can be customized in Word or by using the included Wizard software. How do you write a Chargeback Reversal Agreement (Standard) document? CREDIT CARD CHARGEBACK REVERSAL AUTHORIZATION. This transaction chargeback was reported in error. I (the "Cardholder") agree to the reversal of the chargeback. I also understand that with sufficient tracking information the merchant "Company Name" can provide a rebuttal to the credit card issuer without a signature from the customer and request further investigation. Company Name Attention: Sales Dept - Fax Fax Number. Important: Email, Adobe PDF, Email Faxes or other Electronic delivery of this form will NOT be accepted. 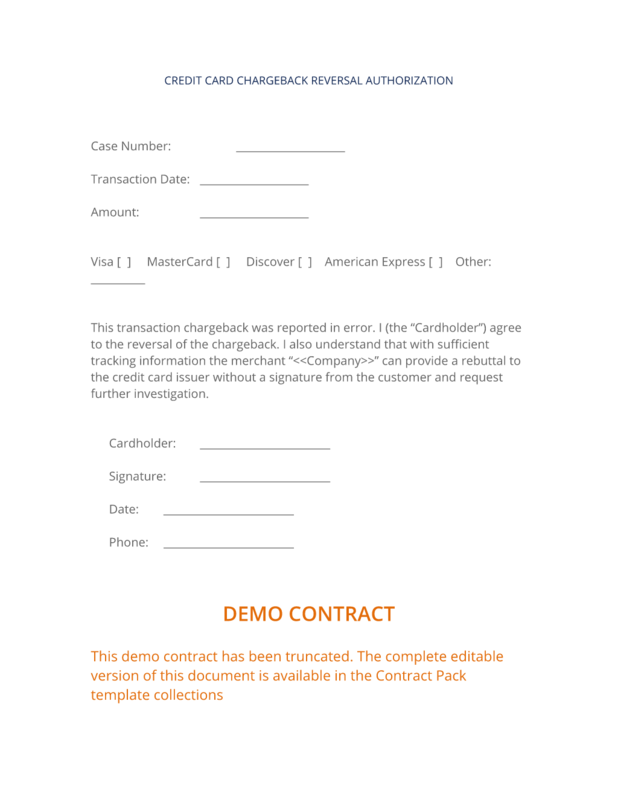 The complete Chargeback Reversal Agreement (Standard) - with the actual formatting and layout - is available in this Contract Pack.